As per the UN stats, water scarcity affects more than 40% of the global population and is projected to increase rapidly. Over 1.7 billion people who have drinking water sources are currently living in river basins where water use exceeds recharge. Due to the awareness created by public organisations and NGOs, we have an increase from 76% of people in 1990 to 91% of people in 2015 using an improved drinking water source. Another important issue is that, about 1.8 billion people still use fecally contaminated water. Another major problem that is faced even today is that, 2.4 billion people lack access to basic sanitation services, such as toilets or latrines. More than 80 percent of wastewater resulting from human activities is discharged into rivers or sea without any pollution removal. Each day nearly 100 children die due to preventable water and sanitation-related diarrhoeal diseases. 70% of water abstracted from rivers, lakes and aquifers is used as such for irrigation. Floods and other water-related disasters account for 70% of all death related to natural disasters. 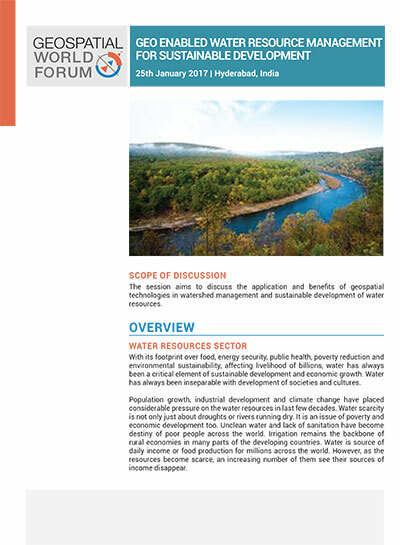 Understanding the importance of water sector to the community, the exclusive half day session on water resources with the theme "Geo Enabled Water Resource Management for Sustainable Development" will be organised on 25th January, 2016 as a part of Geospatial World Forum – 2017. The program will be focusing on demonstrating the practical application of geospatial technologies in the water segment, and the problems faced during its implementation phase. It appears inevitable that during the first half of the 21st century, water shortage will be one of the most serious issues linking diverse problems like food security, international diplomacy, poverty alleviation, public health, energy production, ecosystem management, and preservation of biodiversity. With so much at stake, the importance of implementing informed watershed management practices couldn't be overstated. As a solution to the existing problems, geospatial technology has played a critical role in all aspects of watershed management, from assessing watershed conditions through modelling impacts of human activities on water quality and to visualizing impacts of alternative management scenarios. Realising the power of geospatial technology and its unique ability to enhance watershed management, this session will discuss how geospatial technology can help in better management of the watershed amongst water researchers, resource planners, solution providers and technology community worldwide. Groundwater contributes to the major portion of the world's freshwater resources. The demand for water resources has exceeded population growth by a factor of two or more over the last hundred years. Excess extraction by people has led to dwindling ground water supplies. In addition to this, the rising temperatures have also compounded the problem and altered the precipitation mix. Further, land sinking also occurs when there is loss of support below the ground caused by reduction in ground water table. This is most often caused by human activities, mainly from the overuse of groundwater, when the soil collapses, compacts and drops. With the innovation and advancement in space technology, it is now possible to employ remote sensing techniques for estimating surface and subsurface water over large areas. These methods are very useful for rapid groundwater mapping of large and inaccessible areas. This session highlights how remote sensing data and geospatial techniques can act as good sources and tools for providing data needed for protection of the ground water and also in planning to conserve them.